Eco-label approved product. Super concentrated, tested and approved at dilution 1 part detergent to 1000 parts water. Mild long lasting foam, perfect for dishwashing by hand. Leaves crockery and glassware sparkling clean and streak free. Eco-friendly formulation. 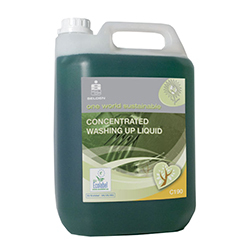 Mild eco-friendly dishwashing liquid for use by hand. Also suitable for floor and general cleaning. Recommended dosage: For dirty dishes: 1 part product to 750 parts hand hot water For not very dirty dishes 1 part product to 1000 parts hand hot water. To wash your dishes in the most efficient way, to save water and energy, and to protect the environment, do not use running water but immerse the dishes, and use the recommended dosage. You can wash most efficiently without lots of foam. Composition An aqueous blend of anionic, nonionic and amphoteric surfactants with viscosity modifiers, preservatives and dye.